Editorials from Theslowlane: Bicycle and wind power, the Tri-Cities? 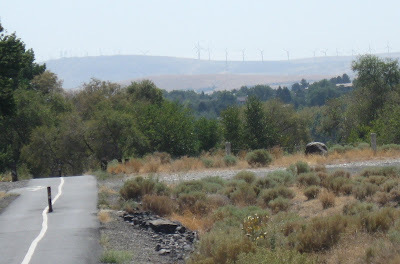 Bicycle and wind power, the Tri-Cities? Now, in the Tri-Cities of Richland, Kennewick, Pasco. Lots of bike paths through these cities. In the parks, along the rivers, along the freeway. What is thought of, by many, as the "atomic cities," have many sides. This is home of Hanford Nuclear Reservation, but rolling into Pasco, the horizon is filled with windmills. Wind power dominates the ridge tops. Maybe not as much energy comes from those wind farms as pours out from The Columbia Nuclear Generating Station, formerly known as WPPS 2 (the only WPPS plant that got off the ground) and the only nuclear power plant in Washington and Oregon that is now operational as far as I know. WPPS stood for Washington Public Power System which mostly went bankrupt in the 1980s. WPPS 2, now renamed Columbia Generating Station, is the one part of WPPS that's working and, so I read (on History Link dot 0rg), generating around 12% of the electricity supplied by BPA here in the Pacific Northwest. Figures for the year 2000. That is a fairly big chunk of our power. Why did most of WPPS go belly up? Many reasons, but I would suggest that natural gas is where the Northwest has turned to beef up it's power supplies as we outgrow our hydroelectric resouce. Natural gas has been fairly cheap and less worry than nuclear; so far at least. Maybe now, with worry about fossil fuel and global warming, nuclear might look better as long as population and economic growth keep demanding more energy. Still, wind farms are quite evident on the ridge tops as I biked into the Tri-Cities area. Wind farms and bike paths seen today.